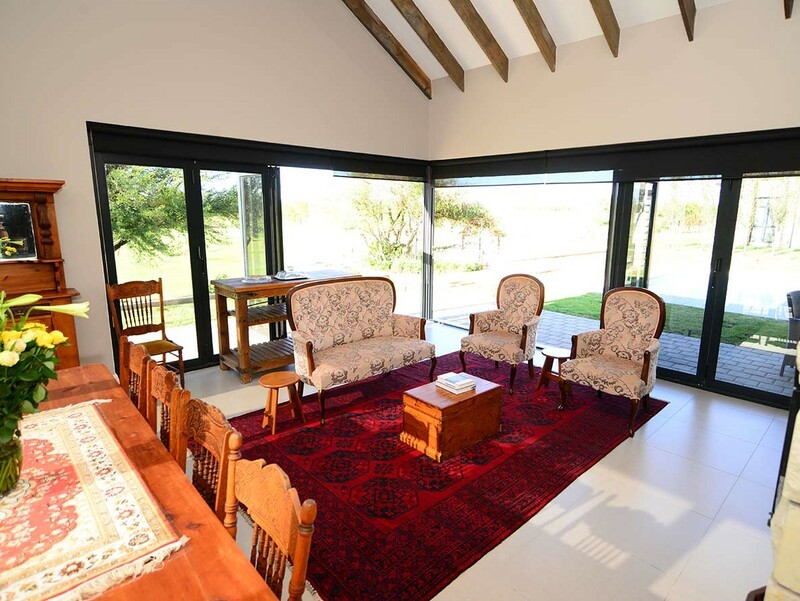 Located in the historical heart of Kimberley Magersfontein Memorial Golf Estate, Newly build Peace Haven Guesthouse offers ONLY 2 elegantly intimate rooms. Each of the air-conditioned rooms has private entrance a flat screen TV, luxury linen, en-suite bathroom with bath and shower and free Charlotte Rys toiletries, kettle and mini bar. A breakfast buffet is served daily overlooking the swimming pool and 16th hole. Dinner can be served on request. Extras include Nespresso coffee. Guests can use the traditional South African braai on the veranda. We're also only a 15 min drive from Kimberley. Take the N12 to Modder River (the Cape Town Road). From the robot at the Caltex Garage on the N12 Kimberley, drive 32 km. You will see silos on your left side – slow down to turn off onto the Jacobsdal road to the left (Ritchie to the right). Keep on this road until just over the train bridge and turn left again at the foot of the bridge, drive past GWK/Landmark. The road curves to the right and becomes a gravel road. Travel 0.6 km and turn right at the security gate. Take the N12 from Hope Town, approximately 35 kilometers before Kimberley, pass the Modder River BP garage on your right - slow down to turn off onto the Jacobsdal road to the right (Ritchie to the left). Room one with it's warm and cosy interiors, comfortable queen size bed, and fabulous extra ensures that everyone who stays here, will want to stay even longer. Room two with it's stunning decor, large queen size bed, and all the lovely extras will leave you feeling relaxed and rejuvenated even after your visit.